When I saw the new assignment for this week this drawing came to mind. It's drawn on watercolor paper because my initial intent was to paint. I ended up changing my mind and using a little bit of everything: ink, pencil and charcoal. I drew it when I was in college. It was a lazy afternoon and I happened to see a photograph that inspired this drawing. I saved it thinking that someday it would make a great father's day present. I don't even know why I thought that. I was single and I didn't get married until 4yrs later. When hubby and I celebrated our first father's day together, little D was 5 months old. 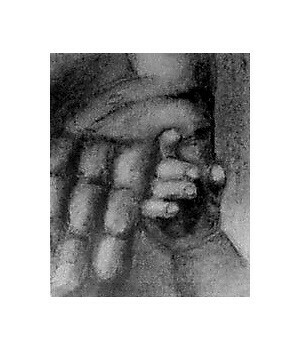 I gave Daddy this drawing and a framed black ink handprint of baby D.
What could be more simple and pure as the love of a parent and child? By the way, Happy Valentine's Day everyone! This is beautiful, capturing a moment of such sweetnes! Love your illo and your sweet story. this is so beautiful! i love it!!! great work! love that daddy received it! Love the drawing, so precious! Happy Valentine's Day Patricia!